After three posts on the materials economy we’ve followed the story of our stuff through extraction, production, distribution, and consumption. What’s left? Well, what do you think happens to our stuff after we’re done with it? I mentioned in my last post that 99% of the stuff we purchase gets thrown away within 6 months. Today we’ll look at where that stuff goes and why the disposal stage of this linear economy might be the scariest yet. Ever since I began this series I have become obsessed with analyzing all the awful things I do as a consumer each and everyday, but it is so hard for us to realize how much we are really disposing of on a year-to-year, day-to-day, and hour-to-hour basis. But the truth is that the average American throws away 4.5 pounds of waste per day! I want to start today’s post by proposing two challenges that will force us to be conscientious of our wastefulness. I challenge you to make a weekly journal of all of the things you throw away. Just like a food journal, writing down our poor decisions makes us less likely to do them. After seeing on paper how much waste we generate throughout a week, maybe we’ll be moved to change our wasteful ways. I challenge you to carry a 5 pound weight for one day. I know this one is a little more unrealistic (and I have to admit I haven’t actually done it myself), but maybe we could come up with some stealthy way to conceal a weighted fanny pack or wear really heavy shoes? I feel that its hard for us to remember what a burden our waste is on the planet, so by burdening ourselves with the extra 5 pounds for one day, maybe we’ll realize that our 4.5 pounds of daily waste really is having a significant impact on the health and sustainability of our planet. This waste we produce either gets disposed in a hole in the ground or it gets incinerated and then buried in a hole in the ground. With the former, our Earth is literally being filled with piles of garbage. With the latter, our air is being filled with all those toxins that were manufactured during production. Our waste is destroying our land, air, water, and climate. While things like recycling do help to a small extent, the problem really comes from the overall amount of stuff we consume. For every one trashcan of stuff we throw away, seventy cans of trash were created during the production stage of the materials economy. It’s totally unsustainable. But what can we do? We have to use some stuff some times, right? Well not necessarily. One family has created a Zero Waste Home, where they literally throw nothing away. While this concept might seem out of reach for every American household. Some of their ideas can definitely be easily transferred into our day-to-day routines. One way to reduce waste in your home is through your diet and eating habits. Simple things, like not using plastic shopping bags, have actually caught on across the country (in D.C. there’s a five cent tax on plastic bags). Avoid single packaged items like yogurt, juice boxes, and “snack” packs. Pack your own food in reusable containers and try to avoid all the paper and plastic waste that accompanies carry-out food. At my college campus, there are no reusable plates, therefore, every time you eat on campus you are required to put your food, no matter how much, in a large thick plastic container and have the food weighed. On top of this, there are no recycling bins to even try to curb the effects of our wastefulness! Another important idea is to avoid upgrading to new items when it’s not absolutely necessary. Hold on to your electronics, including your smartphone, until they really are unusable, and when you can’t resist the social urge to upgrade to the latest version, be sure to donate your old phone. There’s no reason our electronics need to take up space in landfills when they are still totally usable. Check out these places you can donate to. 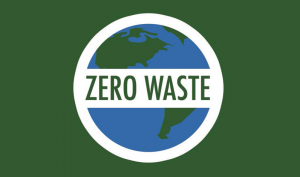 Zero Waste has huge potential benefits for your individual life or family, including major reduction in costs. Just imagine how much you would save if you never bought a paper coffee cup or only bought a new winter coat every five years. It also offers huge benefits for society. Reducing our consumption in general will positively weigh against every negative that has been presented throughout the materials economy in extraction, production, distribution and consumption, and disposal. We need to begin changing the values of consumerism. Instead of having the social norm be more is better, bigger is better, and newer is better, what if we shifted our culture to value savings, restraint, and environmental consciousness. It’s a huge task to undo sixty-plus years of consumer psychology, but if we were tricked into believing in this system enough to be willing to destroy lives and resources across the globe to support it, can’t we be convinced to do the opposite? While the overall goal of creating a sustainable consumption model is large, the steps to get there can be small. Let’s just try to increase our awareness of our own consumption habits and really think about the consequences to our decisions. Try my two challenges this week, and let me know what you think. We’ll keep the conversation going on becoming better, more responsible consumers.